Once a village in the early years, Thane is a popular city that goes through rapid development today. There is so much to this city other than what meets the eye. As a number of home buyers as well as investors are looking out for Property in Thane, its real estate market has doubled over the years. There are many locations in Thane that have grown over the years and one of them is Ghodbunder Road. In fact, this location has turned into one of the most preferred investment locations. 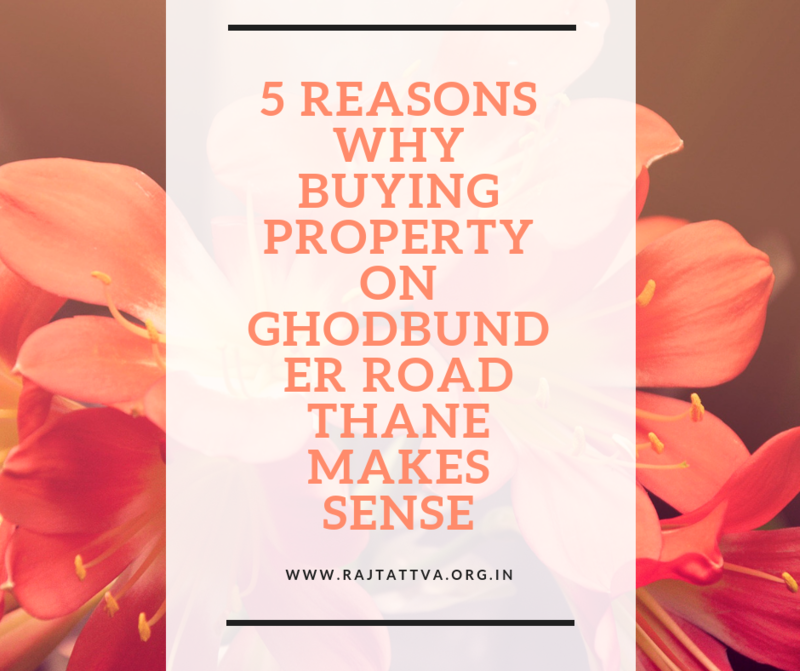 If you are wondering why you should buy property in Ghodbunder Road, here are 5 reasons why. Ghodbunder Road has gone through massive development in physical and social infrastructure. No matter what you might be looking out for, Ghodbunder Road is where you will find it. From reputed schools and hospitals, to malls, shopping centres, supermarkets/hypermarkets, convenience stores, multiplexes, cafes, restaurants, pubs, clubs, lounges, hotels, banks, ATMs and more, all that you need is just a hop, skip and jump away! With a number of IT companies and MNCs setting up their offices at this location, Ghodbunder Road is the new hotspot for career opportunities. Residing at this location will let you head to work and get back home in the shortest amount of time possible. Save plenty of travel-time for the things in life that really matter! Dense roads, the Eastern and Western Highway and good transportation facilities connects Ghodbunder Road to several locations in Thane and Mumbai as well. Residing at this location gives you the best of both worlds, Thane & Mumbai City. Experience easy connectivity and stress-free commuting each day. The major transformation of this location has attracted a number of popular and trusted real estate companies to Ghodbunder Road. Every development offers a wide variety of residential spaces to choose from. You can pick the perfect apartment with ease as the choices are many. Amongst the different residential projects available, Raj Tattva Thane by Rajesh Life Spaces is a project you should definitely consider when looking out for high-end luxury and a low-end price. This residential development contains 5 exquisite towers that offer 3BHK, 4BHK and 5BHK apartments that offer maximum space in every room. When it comes down to amenities, this development offers world-class internal and external amenities for a modern-day living. While the apartments offer every element of luxury for the ultimate level of comfort, the external amenities include a clubhouse, swimming pool, reflexology pathway, barbeque space, sports facilities and the works. The Raj Tattva is affordable and totally worth the world-class features that this development has to offer. You can pick the perfect residential space that is budget-friendly and offers modern-day living of pure perfection!